Hay is grass, legumes or other herbaceous plants that have been cut, dried, and stored for use as animal fodder, particularly for grazing livestock such as cattle, horses, goats, and sheep. 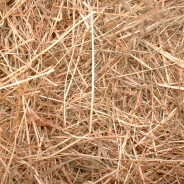 Hay is also fed to pets such as rabbitsand guinea pigs. Pigs may be fed hay, but they do not digest it as efficiently as more fully herbivorous animals. When possible, hay, especially small square bales like these, should be stored under cover and protected from the elements. Small bales are still produced today. While balers for small bales are still manufactured, as well as loaders and stackers, there are some farms that still use equipment manufactured over 50 years ago, kept in good repair. The small bale remains part of overall ranch lore and tradition with “hay bucking” competitions still held for fun at many rodeos and county fairs. Small bales are stacked in a criss-crossed fashion sometimes called a “rick” or “hayrick”. Since rain washes nutrition out of the hay and can cause spoilage or mold, hay in small bales is often stored in a hayshed or protected bytarpaulins. If this is not done, the top two layers of the stack are often lost to rot and mold, and if the stack is not arranged in a proper hayrick, moisture can seep even deeper into the stack. People who own small numbers of livestock, particularly horses, still prefer small bales that can be handled by one person without machinery. There is also a risk that hay bales may be moldy, or contain decaying carcasses of small creatures that were accidentally killed by baling equipment and swept up into the bale, which can produce toxins such as botulism. Both can be deadly to nonruminant herbivores, such as horses, and when this occurs, the entire contaminated bale generally is thrown out, another reason some livestock owners continue to support the market for small bales. Many farmers, particularly those who feed large herds, have moved to balers which produce much larger bales, maximizing the amount of hay which is protected from the elements. Large bales come in two types, round and square. “Large Square” bales, which can weigh up to 1,000 kilograms (2,200 lb), can be stacked and are easier to transport on trucks. Round bales, which typically weigh 300 to 400 kilograms (660–880 lb), are more moisture-resistant, and pack the hay more densely (especially at the center). Round bales are quickly fed with the use of mechanized equipment. The ratio of volume to surface area makes it possible for many dry-area farmers to leave large bales outside until they are consumed. Wet-area farmers and those in climates with heavy snowfall either stack round bales under a shed or tarp, but have also developed a light but durable plastic wrap that partially encloses bales left outside. The wrap repels moisture, but leaves the ends of the bale exposed so that the hay itself can “breathe” and does not begin to ferment. However, when possible to store round bales under a shed, they last longer and less hay is lost to rot and moisture.